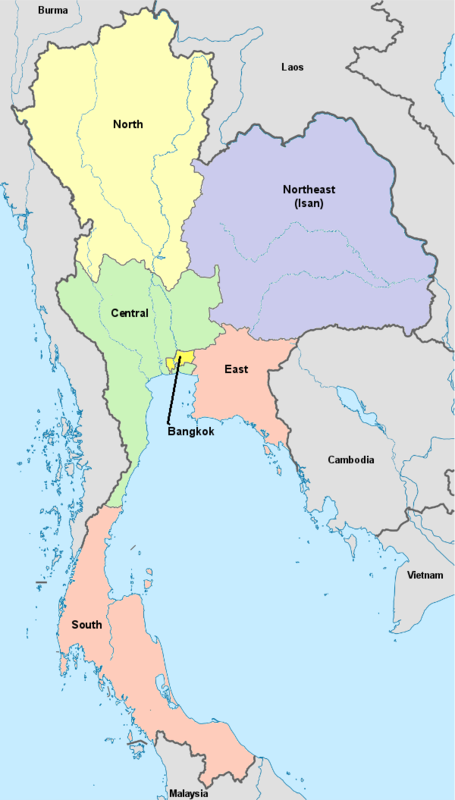 The are a number of 'official' divisions of Thailand into regions. For the traveller, these may be more or less irrelevant. What is relevant is that Thailand is a large country with many distinct cultural and natural regions. Click a region to jump to the details below. The central plains are dominated by the capital of Bangkok, with its royal temples, immense shopping centers and more than 100 museums. Outside of Bangkok, the central region also has the ancient capital of Siam, Ayutthaya. The north is something of the cultural heart of Thailand, home to what is thought to be the first Thai kingdom of Yonok. Descendants of this kingdom established the long-lived kingdom of Lanna in Chiang Mai, which remains the capital of the north and a major tourist destination. Other popular cities in the north include Chiang Rai, a popular base for exploring the Golden Triangle, and Mae Hong Son, for those looking for someplace off the beaten track. To the northeast, a high flat plateau is a region Thais refer to as Isan. Here you'll find many ancient remnants of the Khmer empire that built Angkor Wat, such as Prasat Hin Phimai. East of Bangkok, the coast stretches to the seaside playground of Pattaya.